In our own society, there is no escaping the significance of food. Food and drink keep us alive. They feed our imagination and stimulate our senses. They communicate beliefs. They distinguish rich from poor. They are a blessing that can sometimes become a curse. Each of these statements would have been equally true in the ancient Mediterranean world. This exhibit has been designed by undergraduate students to provide just a 'taste' of the complexities of Greco-Roman food production and consumption. Many - but by no means all! 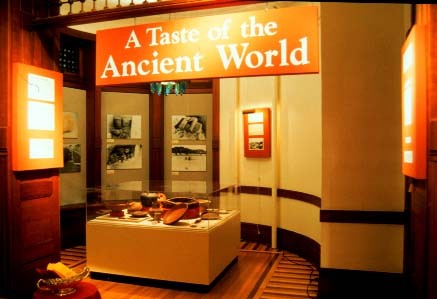 - of the 'food-related' objects in the holdings of the Kelsey Museum are physically on display. This electronic exhibit is designed to showcase items that are kept in storage, and to expand the range of artifacts we can study to explore the significance of food in the ancient world. This exhibit is divided into two parts: Feeding Karanis and More Food for Thought. The text and images in The Kelsey On-Line are for the personal use of students, scholars, and the public. All images are subject to international copyright laws. Any commercial use or publication of text or images is strictly prohibited. Last updated September 10, 1997 by Melanie D. Grunow. Comments and questions about this website may also be directed to Professor Sue Alcock.